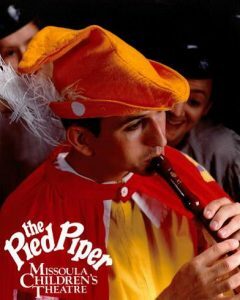 Group auditions for the Missoula Children's Theatre production of the "Pied Piper" will be held on Monday, June 18 from 4:00pm to 6:00pm (auditions begin promptly at 4pm, no late students are accepted) in the Shoreline Room of the Shoreline Center. Students wishing to audition must arrive by the scheduled starting time and stay for the entire two-hour session. The first rehearsal begins approximately 30 minutes after the audition. There is no fee for kids to audition. If your child is selected, you will be asked to pay the registration fee of $90 directly after the audition. If your young thespian is interested in auditioning, register them through the Arts Council website. There will about 10 lead characters that stay for the first rehearsal AFTER the audition on Monday night, June 18 from 6:30-8:30pm. If your child is one of them, please plan on going out and getting them a snack/dinner or bring something to the audition at 4pm that he/she can eat after. We will not be providing any food or drinks after the audition. The students in the cast will be called for dress rehearsal before the performance that day. All those cast must be available for the performance. One free performance ticket will be given to each student who auditions; additional tickets are available for $10 each online or at the door. For any questions, contact Lisa Palmatier at the Arts Council by emailing gallery@shorelinearts.net or by calling 206-417-4645.